Auto sales dropped in March, well below market expectations, led by a decline in sales numbers of three large car companies, General Motors, Ford, and Fiat Chrysler. 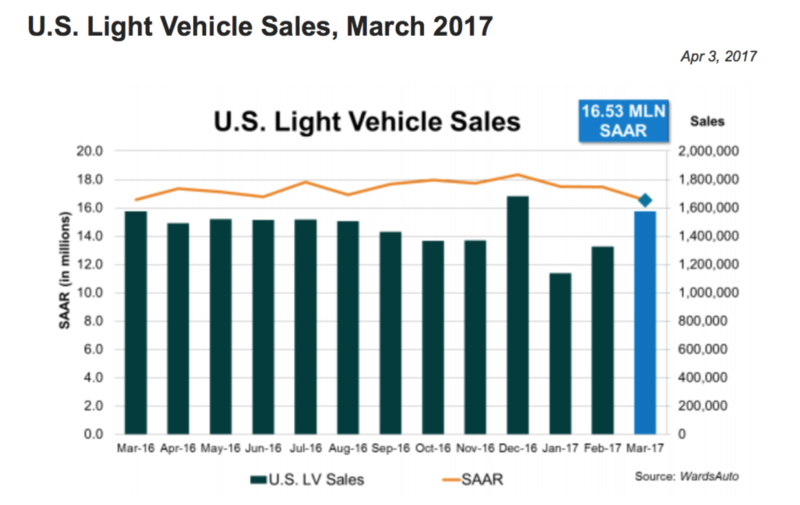 The boom of the auto industry might be weakening but truck sales continue to rise despite the auto industry reaching a plateau. Rising inventories and reduced discounts can cause automaker profits to suffer. The average price paid for a vehicle in March was $34,342, up 1.7% from last year. The annualized rate has decreased to 16.62 million units in March versus of 17.58 million units last month. “Sales overall are cooling off because the market has filled the pent-up demand created by the recession. However, March did not end as high as we expected. I believe there might still be some pull-ahead caused by the strong final four months of 2016 when the seasonally adjusted annual rate averaged 17.9 million” said Haig Stoddard, Wards Auton sales analyst. Consumers are not only price conscious but they are also value conscious when investing in a vehicle. “They think about durability and how many repairs their vehicle might need in year five. Automobile sales have reached a plateau. People don’t seem to be spending as much as they did in the past” said Peter Morici, a business professor at the University of Maryland. Ford’s retail sales were down 1.5% to 157,740 vehicles. Car sales plunged 24.2%, while SUVs and crossovers fell 3.4% and trucks increased 2.5%. The F-series pickup truck, in particular, rose 10.1% to 81,330 vehicles in March. “Ford depends on trucks. It’s very hard to change customer expectations. American trucks are stronger and built better” Morici said. Even Ford’s trucks can’t keep the confidence of investors. Tesla shares were up 7.3% and has surpassed Henry Ford’s automotive establishment by stock market value. Currently Tesla’s market capitalization is $48.69 billion leaving Ford in the dust at $45.47 billion. 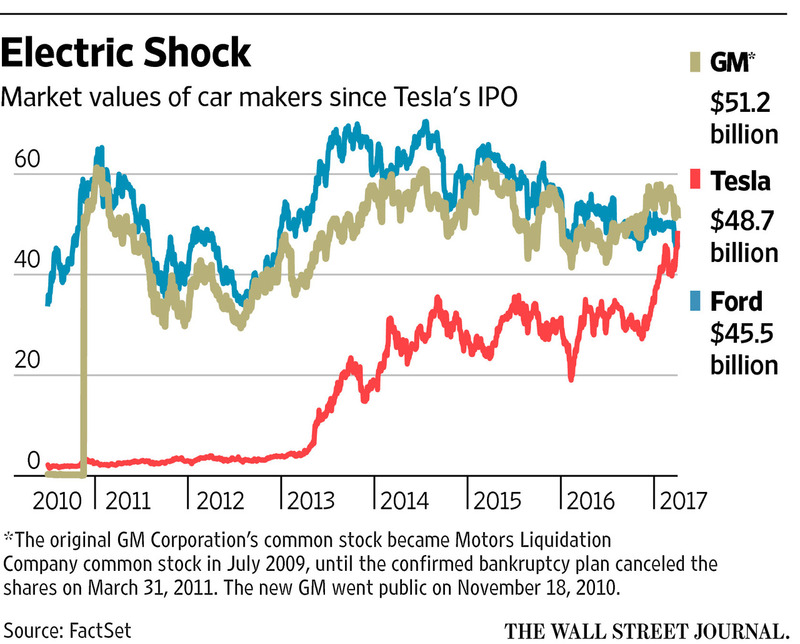 The next victim for Tesla would be General Motors which is valued at $51.19 billion. General Motors also had a rough March as their flagship Chevrolet declined 2.2%, Cadillac also slipped 1.5%. Buick crossovers, SUVs and Sedans rose over 15%. There is a significant gap between cars and trucks, fuel economy on trucks is continues to improve. “There are more trucks, especially cross/utility vehicles, to pick from than ever before. Buyers, young and old, prefer them for their utility” added Hoddard. Fiat Chrysler’s car sales plunged over a whopping 24%. SUVs and crossovers fell 3.4% but trucks increased 2.5%. The company’s notable brand Jeep declined over 11% as well. “Chrysler Fiat continues to face challenges no matter who owns it. It’s all about buyer perception, some people just go to certain companies when they don’t want to spend a lot” Morici weighed in. Some don’t think health insurance payments are competing with car loan payments, “I don’t think they are struggling. I believe that what’s happening is that there were a lot of subprime loans given out and that starting to reverberate at worrisome levels” said Hoddard. According to statistics that were released by Experian Automotive, the average American auto payment is $493 per month on a new vehicle loan. With high monthly payments leaning towards almost $500 a month some Americans are finding it difficult to stick to the terms of their loan especially if it’s during a financially challenging time. On the flip side she pays more than required a month in order to pay off for her car faster. “I think that’s all relative to your income, I find it within my budget, I pay $450 but I usually put $500 a month to help pay it off just quicker and whenever I have extra money I usually throw it at the car” said Britt. Recent data from the Federal Reserve indicates auto loan delinquencies of greater than thirty days or more reached $23.27 billion. Auto payments have increased in recent years because more Americans are buying more expensive vehicles. What can we expect from the auto industry for April? “I expect sales in April to rebound from March to over a 17 million SAAR. An overabundance of inventory will drive more price discounting, and more people likely will have their tax refunds to spend” said Hoddard. Perhaps some of those tax refunds can also relieve the pressures of car loan payments.